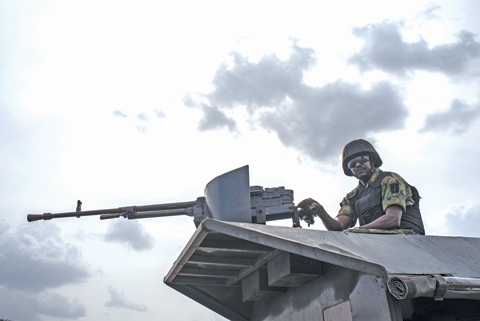 KANO: Forty-eight soldiers were killed in a Boko Haram attack in remote northeast Nigeria, military sources said yesterday, in the latest strike that raises questions about the group’s apparent resurgence and troops’ ability to fight back. Scores of jihadist fighters in trucks stormed the base on Thursday in Zari village in northern Borno state and briefly seized it after a fierce battle. Boko Haram, which has been waging a deadly insurgency in northeast Nigeria since 2009, has intensified attacks on “hard” military targets in recent months, undermining repeated claims by the military that they have the upper hand. Troops have even protested that they are stretched to breaking point by constant security duties and the attacks that analysts tracking the conflict say have become more sophisticated and planned. At least 30 Nigerian soldiers were initially said to have been killed in Thursday’s raid, which was claimed by a Boko Haram faction backed by the Islamic State group. “The casualty toll now stands at 48 with the recovery of 17 more bodies of soldiers in surrounding bushes in Zari by search and rescue teams,” a military source who did not want to be named told AFP. The militants were said to have taken weapons and military equipment before they were pushed out of the base by troops with aerial support. The sources said the extremists were pursued and bombarded by a fighter jet. “The terrorists also suffered heavy casualty from the bombardment,” one of the military officers said. Zari is located 30 kilometers from the town of Damasak, on the border with Niger, which has seen an upsurge in Boko Haram activity. The jihadists are thought to have attacked the base from the nearby Garunda village, where 17 troops were killed and 14 injured in an attack on another military base last month, the sources said. In a statement late Friday the Nigerian military confirmed troops fought Boko Haram “insurgents… on (a) rampage to loot the community and extort money from villagers”. But no death toll was given. The intensified armed campaign in recent weeks, primarily against military targets, has claimed the lives of dozens of troops, providing the government with a headache as it looks to trumpet its security achievements before elections next year. On July 14, militants overran a military base in Jilli village in neighboring Yobe state. Dozens of troops were said to have been killed, wounded or missing.